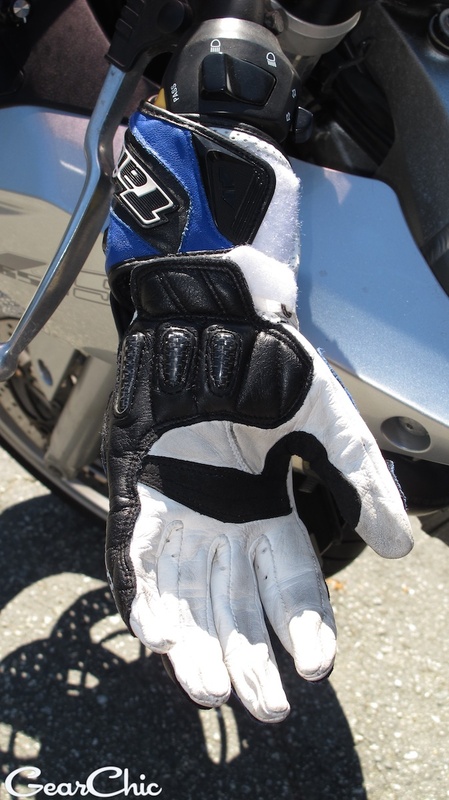 When I asked Audrey at MotoLiberty if I could review these gloves, I was *so* excited to try these out. I've always been a fan of RS Taichi, a brand that isn't as popular here (yet), but is a well known national brand in Japan (a la Dainese/AlpineStars). Aside from gloves, they're also known for their one piece race leathers and textile gear too. If you've ever worn golf gloves, that's how these feel. Extremely soft and supple. They're different from any other glove I've ever tried on or worn. There must be something about the way they raise their cows, or treat their leather. If you're looking for a glove with extreme dexterity but tremendous protection, you'll want to consider these. Will the gauntlets fit well with my jacket? Will my engagement ring (Yes, this is a common problem among women riders!) fit comfortably? How cool will they be for San Francisco? Are my hands going to freeze? Are these too short in the fingers? A problem that I immediately noticed was the fact that the sleeves on my Ignition Jacket were too wide to wear under the gauntlet. The sleeves simply weren't narrow enough to tuck under the glove's cuff. I was soooooo sad about this. Luckily I invested in a new leather jacket with a much better sleeves, not as wide as the Ignition so they're easier to tuck. Riding in San Francisco in the summer is not like riding in the summer anywhere else. The fog rolls in the morning (mostly on the West side of town) and temperatures dip down into the low-mid 50s. Then the fog burns off and the afternoon temps can jump up to the 70s. (higher temps usually kick in around September). My hands can get cold pretty easy, so I dont know if it's because I'm acclimated to our weird temperatures or what, but these are only slightly cool when I'm riding in the morning. Of course, there isn't any wind chlll, and if I were going on the freeway I probably would never wear them at night on the freeway. Once the temps drop to high 50s, I would switch to my warmer, more insulated gloves. I wore these recently at a recent Track Day with ZoomZoom at Thunderhill Raceway (for their 5th annual VIP Women's Day!). Typically, it would be 80-90 degrees in June in Willows, CA but fortunately for us, it turned out to be 60 with a little bit of rain! My hands didn't feel cold once. They felt very comfortable with the overcast skies and mild temps. Hopefully you can see from the photos that they're perforated throughout, between the fingers and all over the tops of the wrists. They're definitely a cooler glove compared to my Racers, which are Kangaroo hide. These breathe so much better than the Racers! Although there is a lot of perforation on the top of my hands, the biggest different is between the fingers. There are no perforations on the palms. When I sweat in them, they continue to breathe comfortably while riding. It's almost like the sweat is evaporating through the palms. With my Racers, it feels like the sweat is trapped between my skin and the glove. I don't know how RS Taichi is able to make their gloves so breathable, but they simply are. As mentioned above, I was worried that the length of the fingers were a little too short, but I realized that was because I was pulling my clutch all the way in to shift. My friction zone is set all the way out so I only have to pull in just a little bit and with only a couple of fingers. (so much easier!). Luckily, It only takes a light touch to shift on my bike. Typically, gloves don't stretch in length. By adjusting my shifting technique, I realized that these gloves fit just fine. Why do I need to pull my clutch in all the way if my friction zone is set all the way out? Either way, they feel great after fully breaking them in. I thought for a minute that my left hand was longer than my right? But then I realized that my clutch and brake levers are set in different places. I also squeeze and use them differently. I have pretty small hands (Size 6.5 in Held, Size Small in AlpineStars and Dainese, Size Small in Racer, REV'IT gloves are too long for me) but not the smallest! RS Taichi doesn't make any sport leather gloves for women, but they do make a "Lady" size in some of their gloves. That's why these are sized "Lady". The label inside actually has that written as the size name. Strange, I know. Generally speaking, their gloves run a little on the small side. Thank goodness for those of us with small hands! One thing about my hands are the fact that they are a little wide from the knuckles to the wrist. Many women's hands are a little more slender than mine around the palm. For this reason, I think that's why I feel resistance around the width of my palms when I put these on. It's usually worse when my hands are sweaty, but it doesn't hinder me from putting them on or wanting to wear them every day. You know when your hands are super sweaty and you dont want to put your gloves back on? Well, these are far more comfortable and tolerable in those conditions than I expected. Once I get my bike going, I can open my hands around my handgrips and feel the breeze through the perforations between my fingers. Ahhhh. I'm not going to say that these would be better than a mesh, textile summer glove, as far as ventilation. But for a protective, fully leather glove, they're pretty comfortable. The idea of my flesh kissing hot pavement makes me cringe. But if you're looking for a protective leather glove for summer, I would highly highly recommend these for your gear closet. I love these gloves so much that they're my every day glove.